I have been using Ubuntu since 2010 and I have no idea how to add apps to start up. Can’t we make it simple ? Maybe a list of applications is available when we click an " Add new " button. It is too complex right now. Are you asking somebody to make a Startup Applications control panel? 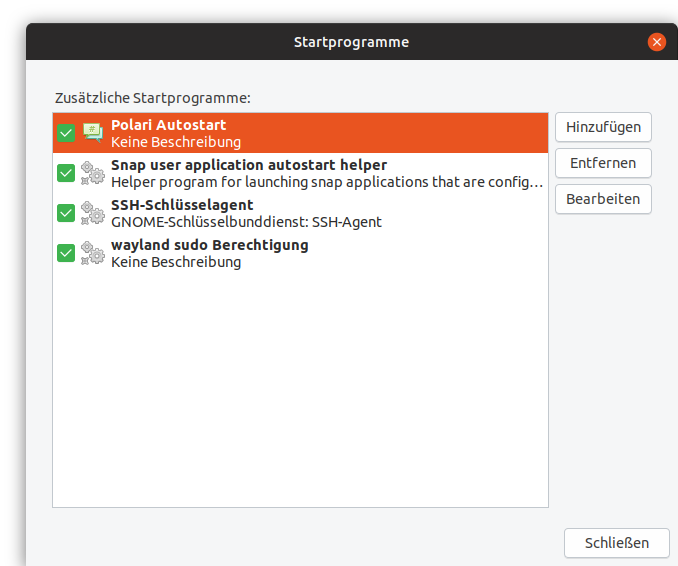 There is the autostart section in Gnome Tweaks for that. Or do I misunderstand? What about the Startup Applications Preferences app? That should be installed by default at least in Ubuntu? If you wonder what the last entry in the pic means: I had set xhost +si:localuser:root in my autostart app to still be able to run Synaptic under Wayland. I always opened it on the commandline by typing sudo synaptic that way. But I shouldn’t have set that command globally for security reasons. And I wasn’t able to open synaptic by just clicking the icon. When I select " Startup Applications ", I see no option to select an app. Instead, I get a few text fields. I always thought that exists. I haven’t used Gnome as much so I’m not sure, but remember it exists in Unity, and I have it in Kubuntu. In Unity, it shows up when I search “startup”, but not “autostart”. Shows up using either search terms on Plasma. Can you send a screenshot of what it looks like? Your trick for synaptic is very useful and I used it right away but i’m unable to imagine a similar solution for gparted, may you suggest one? thanks. Hmm. I don’t use gparted myself, so I do not know if an adapted script would work with gparted as well. # display via xhost, then grant access.